The planned mine would destroy at least 75% of the historic village, four mountains, two communities and archeological treasures dating from the Roman era. In the process, a 600-hectare tailings lake would be created in neighboring Corna Valley, forever submerging the village of Corna in a tomb of cyanide-laced sludge. Nestled among pastoral mountains vibrant with undisturbed forests and rich grasslands teeming with wildflowers, a quiet Romanian village has become the central battleground for a struggle that will most likely determine the state of Romania’s natural and cultural landscape for generations to come. Rosia Montana, Romania, lies in the Apuseni Mountains of Transylvania, a mostly rural region that comprises the western border of Eastern Europe’s Carpathian Mountains. 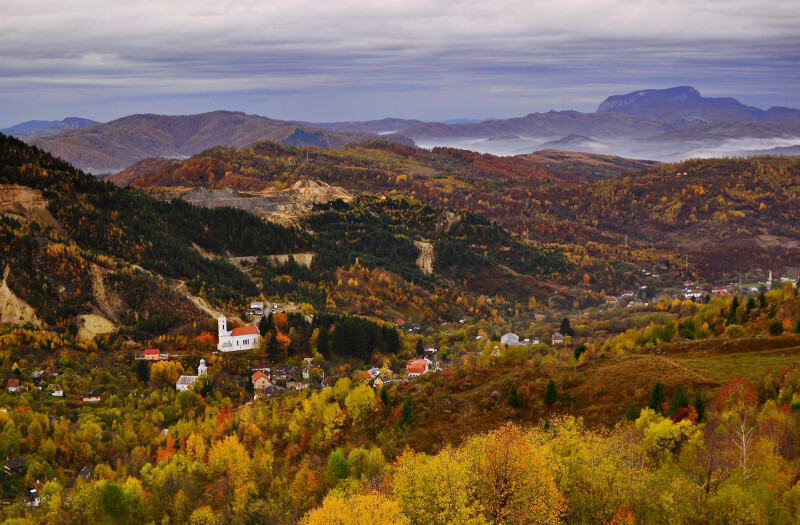 Born from the Roman conquest of the Dacian Kingdom in 106AD, Rosia Montana also sits on Europe’s largest gold deposit. Though mined conventionally underground for over 2,000 years, advances in mining technology have given modern gold prospectors the ability to extract microscopic flakes of gold found in abundance within the area’s layers of rock. To extract this gold, however, requires creating huge open-pits and flooding a picturesque valley with cyanide tailings. With jewelry production accounting for 80% of the world’s gold market, citizens and activists in Rosia Montana are asking if mining gold justifies destroying a centuries-old community, its identity, and the surrounding environment. The true cost of gold, they argue, goes far beyond what is listed on the company’s balance sheet. For over 16 years, Rosia Montana Gold Corporation, a subsidiary of Canada’s Gabriel Resources, has been working to control the media and influence public policy to gain governmental approval for what would be Europe’s largest open-pit gold mine. Only a motley group of local residents and Romanian NGOs have stood in the company’s path of obtaining the necessary permits to begin construction of the mine. Emphasizing environmental degradation, potential cyanide contamination and the desire of UNESCO to make Rosia Montana a world heritage site, local opposition has so far been successful in delaying approval of the necessary permits through public protests and various legal challenges. However, recent actions by the Romanian government suggest how far the government of Prime Minister Victor Ponta is willing to go in order to support the private interests of Gabriel Resources. In April, the government created a separate state mining company that is focused solely on beginning mining operations in Rosia Montana. In July, the same government included Rosia Montana in its list of “national investments” with the ominous declaration that the mining project in Rosia Montana will represent an “exploitation with new environmental standards”. Meanwhile, legislation is being introduced that would change the current mining expropriation law giving private mining companies the power to forcibly remove property owners from land needed for the mining project. In an effort to raise international awareness to the threat, one of Europe’s most prestigious heritage organizations, Europa Nostra, has included Rosia Montana on its list of the seven most endangered heritage sites in Europe. Rosia Montana contains a multitude of vestiges from its multi-cultural past including six archaeological sites of national and world value, 140 kilometers of underground galleries from the Roman, medieval and modern periods, and 50 buildings listed as historical monuments. Likewise, national and international experts in archeology, botany, historical architecture, ecology, and economics have testified to the world-class value of Rosia Montana as a unique addition to the world’s treasury of heritage sites and the need to preserve its value for future generations. 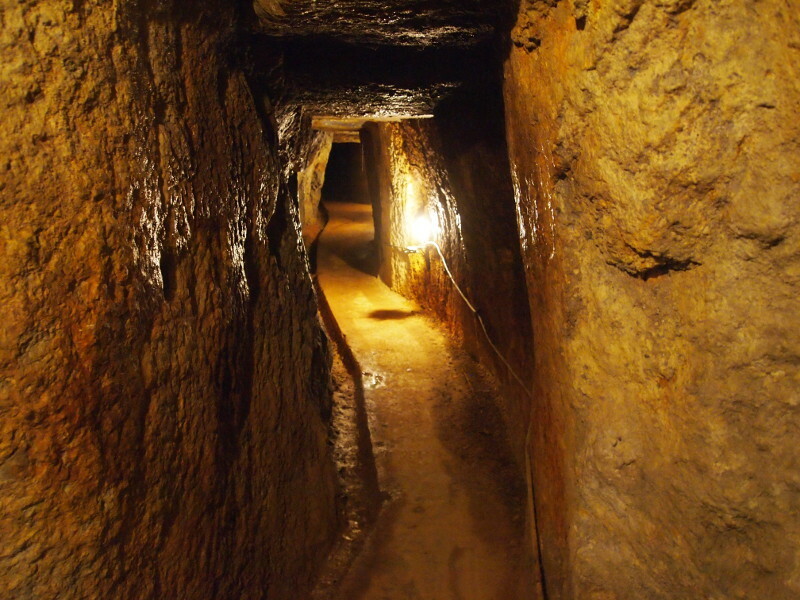 A nearly 2,000 year-old Roman gallery in the village of Rosia Montana. Photo by Alexandra Dodu. In 2009, the Rosia Montana Cultural Foundation was formed in order to raise awareness to the national and universal value of Rosia Montana and to provide clear and accurate information regarding the effects of open-pit mining on the community’s natural and cultural heritage. The Rosia Montana Cultural Foundation actively seeks to include Rosia Montana on UNESCO’s list of world heritage sites and is working to develop a sustainable local economy based upon tourism, agriculture and environmental education. In the Apuseni Mountains, over a dozen mining leases have been obtained from the Romanian government by international companies from as far away as Australia seeking the region’s vast supply of natural resources. If the government allows the Rosia Montana mining project to proceed despite testimony from the world’s experts, there is very little reason to stop these companies from beginning their own projects of resource extraction. In a short time, the Apuseni Mountains of Romania, with some of Europe’s largest undisturbed forest and home to wolves, brown bears and lynx, will become a scarred landscape of open-pits, cyanide lakes and broken promises. The real question is what is lost if a private company is allowed to destroy a community and 2000 years of archeological treasures unique to the world. This is not just a community’s problem, nor is it an issue only for Romanians or Europeans. This is a problem for all of us, as citizens of the world. If we allow Rosia Montana to be destroyed, the mark upon our generation will surely be a black mark for all future generations to ponder. Why, they will ask, did we not have the capacity to alter the course of history so that history would be preserved for all. David Paty is vice president of Roşia Montană Cultural Foundation. For more information, please visit www.rosia-montana-cultural-foundation.com.